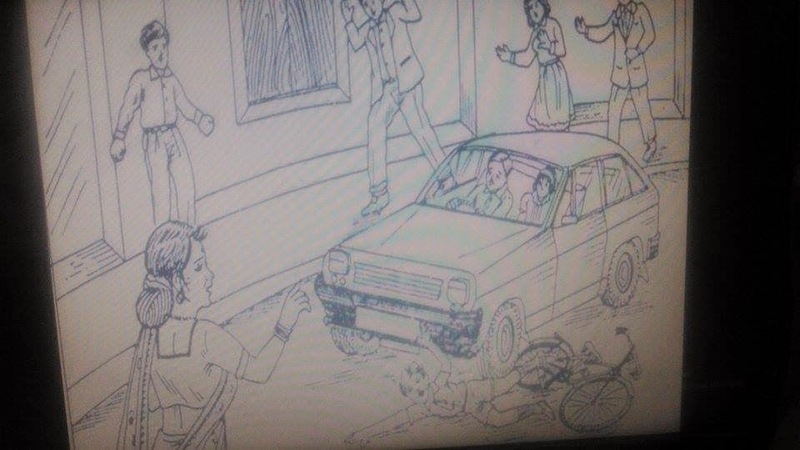 23 comments to ''Negative PPDT Picture: A Car Accident Scene "
suresh, a 19 year old teenager is a 2nd year B.A student from Allahabad University. One day when he was on his way to his college to attend his NCC seniors meeting, the weather abruptly changed and heavy rain started. He saw a old woman was in her half way to cross the road, the car running parallel to him moved toward her.He increases his speed and stopped the car and when the car stopped his bicycle slipped and he fall on his knees. After that they came to know that woman was blind so suresh helped her to cross and get appreciation and thanks from her. He was also praised by the car owner for his courage and presence of mind. sunita is 40 years old working woman and self dependent she is a mother of 2 child one day while she go to the market for shopping she saw that a car driver hit a 10 year old boy who was riding on his bicycle she saw that other people were just seeing this whole scene but nobody came forward to help that boy so she immediatly rush towards the child to save him and requested that car owner to take him to the hospital because of her bravery the child is safe now and she get apperciation of her act. Rahul an 8 year old boy was trying to learn cycle and Ramesh was going to drop her daughter to school and suddenly accident happened. ramesh immediately takes rahul to hospital and call his parents and tell them about the accident. As the accident was no one's mistake rahul parents thanks ramesh for the first aid and let him go after which he drops his daughter to school and then back to home. Mahesh was an it engineer lived in a town.one day he was going for office then he saw small boy riding his cycle in wrong direction hence an small accident happen between car and that bicycle.He went near the place and picked up the boy with the help of other people and kept inside the car for hospital.after some time he got well.Later he instruct him not to ride bicycle on wrong way. John a class5 student is trying to learn bicycle on his own & lost his balance and fell on the left side of the car. Vishal a doctor who was riding with his daughter stopped his car and gave him first aid. The boy's mother & ppl walking down the street rushed to the spot and thanked the doctor for his helping tendency. ramesh was an engineer, he was working in pwd dept and he had one daughter who was studying in 9th std.one day when he was returning from his daughter's school, suddenly one boy came under his car accidently. at the same moment ramesh came out from his car and he found boy's leg was bleeding so he removed he coat and cover his wound. ramesh put him in the car and take him to the hospital where he told the doctor to give him a quick surgery as he was bleeding so doctor took him to the ot and operate his leg. few hour later when doc came out and inform ramesh abt his condition that he leg is fine now.ramesh informed his parents by took the no. from him, as his parents reached at hospital they scolded the ramesh very badly but he didt utter the word as he felt himself guilty and he allowed to take the legal action on him but his parents refuse to take any action and left the hospital by saying thx to him as he saved their son. Ram is doctor and he was going to own hospital with his wife. He was driving speedy because one emergency call had come to ram. Subsequently crowd gathered around ram's car. Alok was a student of bsc physics honours he was academically as well as physically sound.once in the morning in the market when he was going to give his physics paper exam in his university he saw a small boy hit by a car on the road he immediately rushed near the boy and found the boy was unconcious he immediately shouted and asked the other people to help the boy to admit into the hospital alok took the boy in his lap into the car that had hit the boy and blew air into the boys mouth and immetiatley reached to the hospital and admitted the boy into the hospital he telephonically informed his parents about the incident that had took place and asked his own parents to come and take care of the boy as he was getting late for hi exam and he even did not had any information of boys parents after aloks parents reached the hospital alok immediately went to his examination centre gave the exam witin remaining time with hi full spirits and after the exam was over he went to the hospital where he found the boy was out of danger and now he informed his parents about the incident and they came and thanked Alok for hi great work who saved Thier only child life .Alok felt a bit emotional and his parents were proud of their child . Jai was taking his daughter to school at the same time a boy was riding his cycle fast since it was getting late to the school. The boy lost his control and fell before the car. Suresh made a sudden brake and stopped the car, gave first aid to the boy as he was wounded using the kit available in his car, Suresh dropped the cycle in the near by cycle shop and took the boy in his car so that both can be in the school on time. Naveen was a middle aged rich man living in an urban area with his family. One day he along with his daughter were heading towards marker in there car to buy her a bicycle. On there way, Naveen saw a puppy who suddenly came in front of the car and suddenly he have to roll his steering towards other side. Unfortunately naveen hits a school boy with his bike on the other side. Everybody were shocked to see the accident. Suddenly a lady who was the mother of school boy saw him lying on the road and injured, ran towards him, meanwhile Naveen rushes out of his car to help the boy, made him sit inside his car and rushes towards hospital. He apologized for his mistake. As the accident was not done intentionally, so the mother thanked Naveen for taking her boy to hospital. As the bike got broken up due to accident, so Naveen decided to buy him a new one as an apology. Soon the boy gets fit. Naveen was a middle aged rich man living in an urban area with his family. One day Naveen and her daughter were heading towards marker for buying a bicycle for his daughter. On his way, Naveen saw a puppy who suddenly came in front of his car, in order to save him he rolled his steering to the other side and unfortunately hits a young school boy riding his bike. Everybody were shocked to see the accident. Suddenly a lady who was the mother of that boy ran towards him, meanwhile Naveen got out of his car, made that boy sit inside and rushed him to hospital. The doctor declared that the boy was out of danger, Naveen apologized for his mistake to the little boy and his mother. As the bike got broken up because of accident so Naveen decided to buy a new one and gifted it to the boy. Soon the boy got fit and ready to ride his new bike. Ramesh is an engineer and going to attend the meeting in his office.he was late so he was driving the car too fast.while on way he met with an accident with school going boys golu.as he was in hurry to reach to office he ignored the accident and ran away from the spot.ram was standing near the spot tried to stop the but car but he couldn't.but he noted down the no. Of the car.without any delay he rushed to the hospital with injured golu.golu was trated nd he got well soon.mean while ram informed the police and gave the car no.very soon suresh got captured and punished for his crime.ram was appreciated for this.